Friends or family, old or young, the Wild Wadi Water Park has something for each one! Located on the grounds of the great Jumeirah Hotel, the water park is themed on the adventures of Juha, a famous character of Arabian folklore. 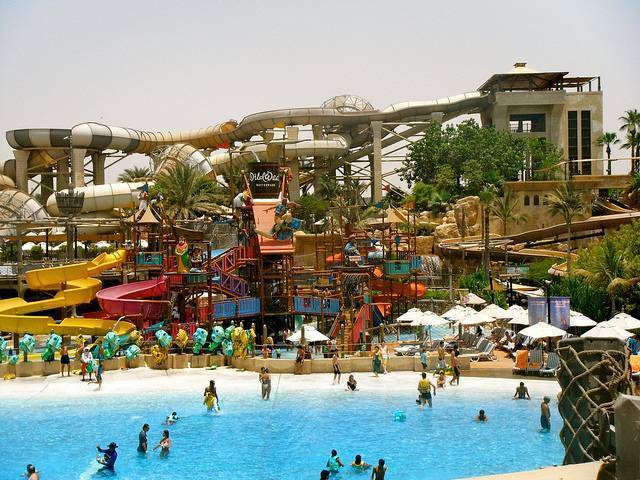 Wild Wadi offers more than 30 rides and attractions of different kinds. Plenty kid friendly rides allow children to splash around in the cool water or get onto some fun slides. River rapids to high speed slides, water coasters and tornado splashes, rides like Jumeirah Sceirah, Master Blasters and Tantrum Alley are sure to instill an extreme sense of thrill among the daring. Relaxing rides like the Lazy Pool attract many visitors hoping to bask in the sun. Juha’s Journey, the largest wave pool in U.A.E, and Flood River, an exciting river rapid are ideal rides to have some family fun! An eminent attraction of the water-park is Wipeout and Riptide, a flowride that offers the ultimate surfing experience, all within the limits of a large pool. Reasonable prices, enthralling rides, attractive landscaping and the jolly atmosphere of Wild Wadi Water Park will leave everyone drenched in happiness and contentment!